How effective are mobile ads? Placed and Millennial Media are working together to help answer the industry’s $8.5 billion dollar question through a new partnership. Powered in part by Placed Attribution, Millennial Media introduced its new Omni Channel Measurement Suite, which is designed to evaluate and demonstrate the effectiveness of mobile campaigns across a variety of important areas. 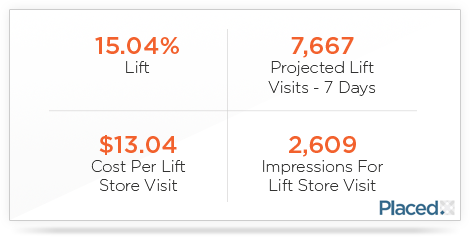 Placed Attribution is a key part of the new solution, delivering insight into the impact of mobile ads on driving in-store retail visits. With more than 90% of retail transactions taking place in the physical world, understanding the offline effect of mobile ads is arguably more important for a marketer’s bottom line than CTRs and other on-device metrics; especially for those brands with a brick-and-mortar presence. Placed Attribution’s programmatic approach to measurement provides advertisers and agencies with consistent metrics to know if ad exposed audiences turned into in-aisle shoppers, with metrics such as Store Visits, Lift, and Demographic Features. Millennial Media is the latest company to join a growing list of partners, which includes xAd and Verve, that are leveraging Placed Attribution to bring improved location intelligence to today’s burgeoning mobile advertising economy. Visit our website to learn more about Placed Attribution or contact us at info@placed.com with questions.